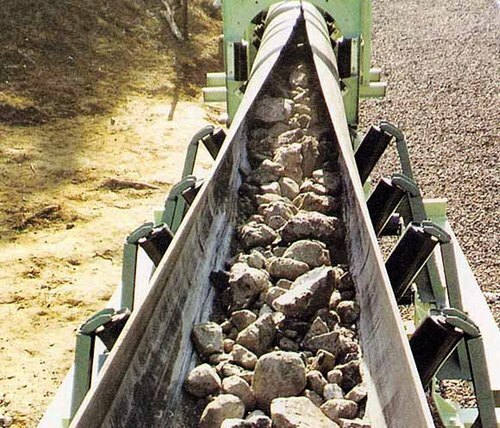 We manufacture efficient pipe conveyor that is used for coupling fitting applications. This conveyor is constructed from mild or stainless steel and is known for features of corrosion resistance, high tensile strength and efficacious performance in complex conditions. It is mainly used to convey powdery or dusty materials, the belt changes its form from flat to U and finally fold in pipe shape and carried out the process of enclosed conveying. Our organization is backed by rich industry experience of more than 7 years in offering Material Handling Products, industrial material handling equipment, bulk material handling equipment, centrifuge separator,Pneumatic Conveyers, Crushers, Vibrating Screens and Grinders. The range available with us encompasses Bulk Handling Equipment, Silo Feeding and Extraction Equipment, Conveyor Belt & Accessories, Dampers, Crushers Batching Plant, Vibrating Screen, Cement Plant Machinery and Spares, Enmass Conveyor and Drag Chain. These are appreciated for application specific design, simple installation, high performance and low maintenance. Thus, our complete range caters to the requirements of Pharmaceutical, Cement, Construction, Metallurgy, Rubber /Tyre and Engineering related industries. Our domain expertise also allows us to provideEquipments for Water & Waste Water Treatment Plants such as Clarifier mechanism/ Clarifocculator, Demister tank/Drip Trap, DAF/TPI System, Diffusers (fine & coarse) and Pump & Spareto name a few. With the assistance and support of our diligent team, we have served our clients in the best possible manner and completed the ordered consignments within the given time. We are the leading manufacturer of industrial material handling equipment, material handling products, bulk material handling equipment and centrifuge separator.